Patient will present as → a 25-year-old male presents complaining of extreme weakness, 20-lb weight loss, lightheadedness, and dizziness. On physical exam, he appears ill, and his blood pressure is 90/70 mm Hg. He has dark skin and hyperpigmented creases on his palms. Serum sodium is low, potassium is elevated; urea level and serum calcium are both elevated as well. How do you remember what ADDISON’s disease is? What are the electrolyte findings? 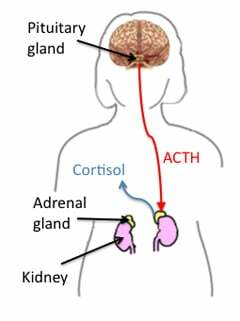 Adrenal insufficiency can be primary or secondary, and chronic or acute. Primary, or Addison’s disease, is due to autoimmune factors, infections, or disease within the adrenal gland. This causes a decrease in cortisol secretion. AUTOIMMUNE: About 70% of cases in the US are due to idiopathic atrophy of the adrenal cortex, probably caused by autoimmune processes. In Western societies, the cause is usually assumed to be autoimmune, unless there is evidence otherwise. Adrenal autoantibodies can be assessed. A chest x-ray should be done for TB; if doubt exists, CT of the adrenals is helpful. In patients with autoimmune disease, the adrenals are atrophied, whereas in patients with TB or other granulomas, the adrenals are enlarged (initially) with frequent calcification. Bilateral adrenal hyperplasia, particularly in children and young adults, suggests a genetic enzyme defect. Addison’s disease should be treated with cortisol replacement therapy. Patients may also require androgen replacement therapy. 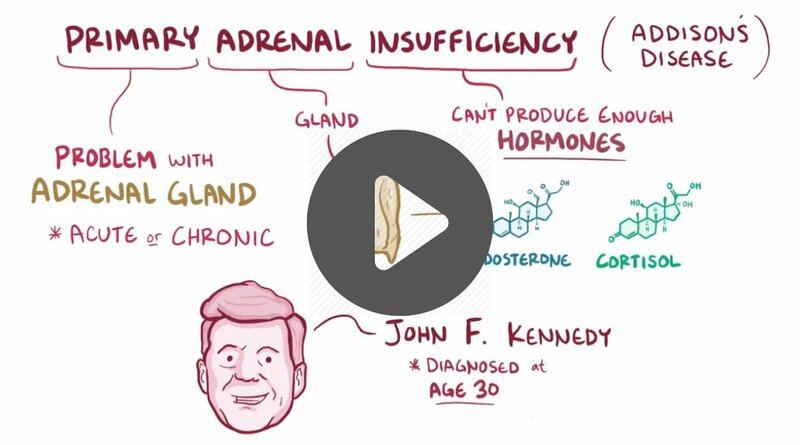 With secondary adrenal insufficiency, the cause should be the focus of treatment. This could entail resection of a pituitary adenoma. Patients going off steroid therapy should be slowly weaned off the medication to prevent adrenal insufficiency. Complications: Addisonian crisis, shock, seizure, coma. 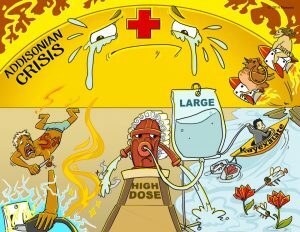 Addisonian Crisis: This is a life-threatening emergency, which involves intense nursing care to address the signs and symptoms of acute adrenal insufficiency. It often occurs as an outcome from a stressful situation, such as surgery, trauma, severe infection, or the sudden withdrawal of exogenous corticosteroids. A 24-year-old man comes to your office with the following symptoms: an extreme feeling of weakness, a 20-pound weight loss, a change in the color of his skin (his skin has become hyperpigmented), and lightheadedness and dizziness. On examination, the patient has definite skin hyperpigmentation since you last saw him 9 months ago. His blood pressure is 90/ 70 mm Hg. He looks acutely ill. On laboratory examination, his serum sodium is low (115 mEq/ L), his serum potassium is high (6.2 mEq/ L), his serum urea is elevated at 9 mg/ dL, and his serum calcium is elevated (12 mg/ dL). This patient has Addison's disease or primary adrenocortical insufficiency. The prominent clinical features of Addison disease include weakness (100%), weight loss (100%), hyperpigmentation (95%), and hypotension. The pertinent laboratory findings include hyponatremia, hyperkalemia, increased blood urea nitrogen, hypercalcemia, increased plasma ACTH, and decreased serum cortisol level. What is the most likely cause of this patient's symptoms? Most commonly, Addison disease results from an autoimmune destruction of the adrenal gland. At least 50% of patients with Addison disease have anti-adrenal antibodies. Other potential causes of adrenocortical insufficiency include tuberculosis, disseminated meningococcemia, and metastatic cancer. What is the acute treatment of choice for this patient? Because of the acutely ill state of this patient, dexamethasone sodium phosphate 4 mg every 12 hours or hydrocortisone 100 mg intravenously every 6 hours for 24 hours should be administered acutely. If the patient shows adequate clinical response, the dose may be tapered gradually and changed to oral prednisone. The chronic treatment of Addison disease is a combination of hydrocortisone (15 to 25 mg/ day) and fludrocortisone (0.05 to 0.3 mg/ day). This combination is based on the need for a combination of glucocorticoid replacement and mineralocorticoid replacement. Dosage is increased for stressful events such as infection. Watch for activation of latent tuberculosis.